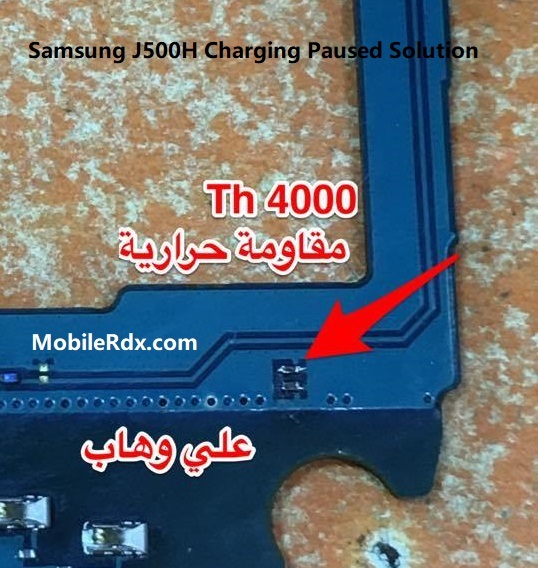 Samsung Galaxy J5 J500H charging paused problem is known to be the most common one, and this is mainly because of the fact that a little bit of physical damage or water damage to the charging connector pin is enough to trouble with your phone’s charging connector. However, there could also be other reasons of this problem like a faulty charger or phone’s battery. The Problem is the charging paused or we called thermistor. so you Need to remove the thermistor and replace from the other board. Just Follow the Picture Shown Below. Clean charging dock strip and check. If the problem persists or if the pins are damaged then you need to replace the entire charging dock strip. Now check the voltage of 1st pin (from right) of charging connector with the help of a Multi-Meter, if there is a problem then re-solder charging pin. Check the connection between charging pin and Capacitor, if the connection is broken re-solder it or place a jumper. The charge is provided to the Samsung J701F board via Capacitor. Samsung J500h heats up during charging. No response when charger is connected. Charging connector/pin might be faulty or is dirty. Charging dock strip is faulty. The phone might be water damaged, hence damaging the charging dock/charging pin. There are also chances that the phone’s battery might be faulty. An uneven voltage at different points on charging dock. Any of the components or capacitors might be damaged or short. Power IC could also be faulty, hence forbidding your Samsung Galaxy J7 Nxt J701F to get any charge. Battery pins could be rusty or damaged.